We’d love your help. 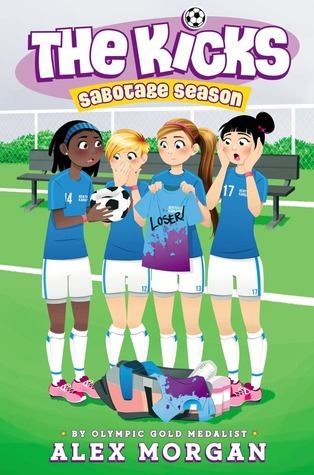 Let us know what’s wrong with this preview of Sabotage Season by Alex Morgan. The Kicks’ championship hopes are being sabotaged in the second book in a series that celebrates confidence and teamwork, from star soccer player and Olympic gold medalist Alex Morgan. Things are going wrong left and right for the Kentville girls’ soccer team, and Devin’s sure the girls from their rival team, the Pinewood Panthers, are behind the many mishaps. Can Devin get The Kicks’ championship hopes are being sabotaged in the second book in a series that celebrates confidence and teamwork, from star soccer player and Olympic gold medalist Alex Morgan. To ask other readers questions about Sabotage Season, please sign up. what age group recommended for? Is Isabelle in this book ? I read this book to my cousin over the Thanksgiving break. She is really into soccer and found this book enjoyable. She really liked the fact that it was a book that related to what she is interested into at the moment. The book depicts the lives of three girls that are going up against their rivals in a season of many mishaps and follies. It is a cute book for any girl that is interested in soccer and I find it very important for books like this to be available to students. They want to read ab I read this book to my cousin over the Thanksgiving break. She is really into soccer and found this book enjoyable. She really liked the fact that it was a book that related to what she is interested into at the moment. The book depicts the lives of three girls that are going up against their rivals in a season of many mishaps and follies. It is a cute book for any girl that is interested in soccer and I find it very important for books like this to be available to students. They want to read about what they are interested in, and by being able to read them, they gain more knowledge of the topic they like. I love soccer and school, but is it better to focus on one thing more? I liked this book because it helped me understand that I shouldn't be too focused on just one thing. I now know that it is better to balance out the multiple things that you might have to do and not focus on just one thing. I recommend this book to young soccer players like me and I think it can help you understand like it helped me! I was very happy when I found the series of books. I love Alex Morgan so I decided to giver her books a try. This gook is about a girl who moved from far away and is really good at soccer. When she moves, she decides to try out for the soccer team and makes it. But when she gets elected team captain the season takes a wrong turn when there is someone trying to sabotage them. The team has to figure out who has been doing it. I loved this book it had good soccer stuff but also a mystery. this was a great book. I loved it it had good soccer stuff and mystery. it was a great book. Love Alex Morgan. But this a Soccer(Futbòl) player and an Author. I thought she was Awesome before but this takes the word awesome to a whole other level! I think this book is about how you have to know that there are bullies out there in the world!! I say this book is good for kids any age that like soccer!!! Read with my daughter who plays soccer and watches National Team Games. It was fun for both her and me reading in a "popcorn" style! This is a Full Fathom Five book. This is another great book by Alex Morgan!